In the meantime, a total of 35 vehicles have been equipped with the new missile system integration kit. The modernized Marder 1A5 is now able to utilize the MELLS, a German acronym standing for “multirole-capable light antitank missile system”. This retrofit contributes to the combat effectiveness of the Bundeswehr’s mechanized infantry units and thus to the credibility of the Federal Republic of Germany in international security contexts. Rheinmetall has accumulated massive expertise in all aspects of the Marder. The weapons system first rolled off the assembly lines of Rheinmetall’s forerunner in Kassel. Extremely reliable and battle-tested, the Marder is destined to remain an important workhorse of Germany’s mechanized infantry for several years to come. 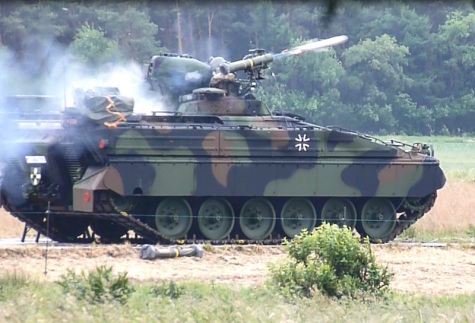 Rheinmetall is currently looking at ways of integrating the MELLS into the 1A3 and 1A5A1 versions of the Marder as well.